Oscar is one of those movies that has never quite gotten the praise it deserves. Which is not to say it's a "great" movie by any means, but it's certainly deserving of more attention. Those who have ignored the film over the years get a new chance to finally check it out, with a solid A/V presentation and a nice new bonus segment featuring comments from Director John Landis. Loaded with wonderful character actors; a sharp, witty script; and a better-than-you've-heard performance by lead Sylvester Stallone, Oscar isn't for everyone, but if you think you might be interested, it's certainly Worth a Look. There are older movies that I have a fondness for and I often wonder if others feel the same way. 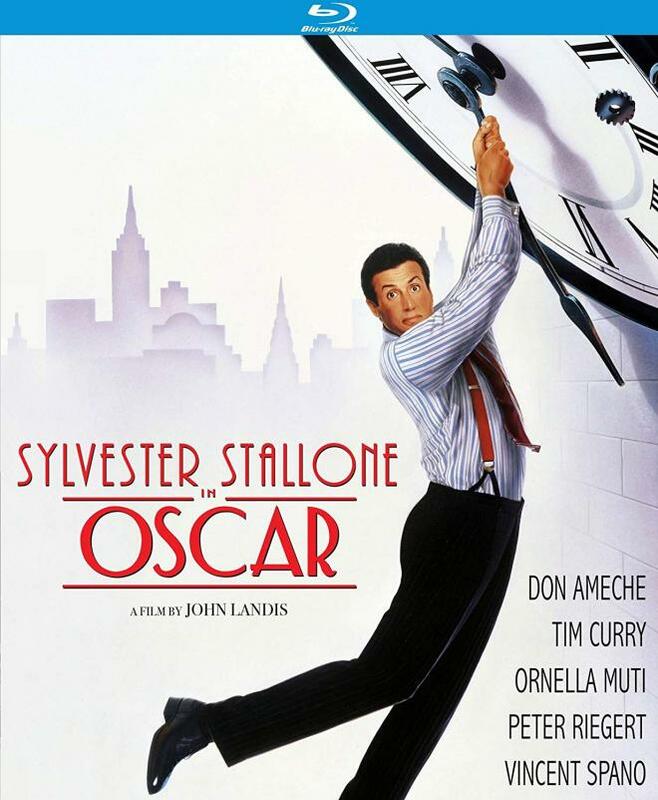 One such film is 1991's Oscar, a screwball comedy of misunderstandings and misdirection set in the early 1930s, directed by John Landis and starring Sylvester Stallone and a cast of recognizable 90's character actors. The movie – where the comedy comes almost exclusively from the dialogue (which I love) and not from slapstick (which I've never been a big fan of) – didn't set the box office on fire, nor would I classify it as a "great" film. But it has enough memorable moments that it has stuck with me all these years later, and I'm glad to see it finally make its Blu-ray debut. Stallone stars as "Snaps" Provolone, a gangster who promises his dying father (Kirk Douglas) that he'll go straight in the movie's pre-credits sequence. The story then picks up a handful of weeks later at Snaps' mansion (where 90 percent or more of this movie takes place), where he's about to meet with some local bankers to establish himself as a respectable member of the community. Unbeknownst to him, across the street, local cop Toomey (Kurtwood Smith) has set up a surveillance of Snaps' home, hoping to get some evidence against him by viewing all the comings and goings – of which there will be a lot over the film's roughly 109-minute running time. The visitor to Snaps' home that will have the biggest impact on the plot that is about to unfold is his accountant, Anthony Rossano (Vincent Spano), who informs Snaps he's in love with his daughter and wants to marry her. He's come to ask for a raise, but in the process also informs Snaps that he's embezzled $50,000 from Provolone, which he's converted into jewels. Snaps hopes to reclaim the jewels by having Anthony give them to his daughter, Lisa (Marisa Tomei), as a wedding gift... but this is only the beginning of Snaps' problems. It turns out that Anthony isn't in love with Lisa, but rather Theresa (Elizabeth Barondes), a woman who told Anthony she was Snaps' daughter. Meanwhile, Snaps' real daughter, Lisa, wants to get from out of her father's rule, so she hatches her own marriage plans – starting by telling her father she's pregnant (she's not) and that the baby belongs to the family chauffeur, Oscar – the person whom the film is named after but has very little to do with the plot (he has a cameo at the end of the movie and is played by one of the film's screenwriters, Jim Mulholland). A large chunk of Oscar is devoted to Snaps trying to manage everything, including juggling his two "daughters", a continuing switcharoo involving a pair of bags – one of which contains the precious jewels and one of which contains his maid's (Joycelyn O'Brien) underwear (matters are made worse when a third bag containing $50,000 cash is thrown into the mix), and trying to make sure everything goes right for the pending meeting with the bankers. 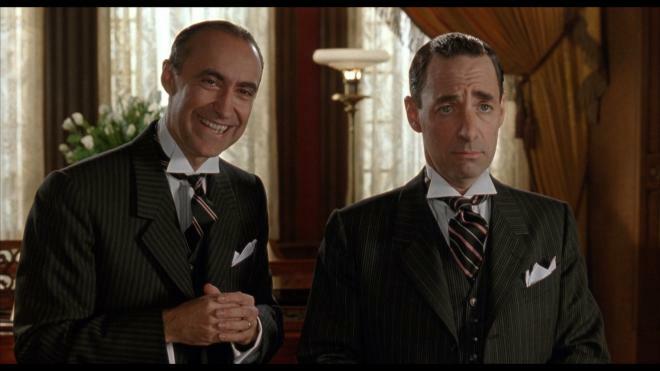 I would be remiss though if I didn't mention my two favorite characters in the movie, the Finucci brothers, played with glee by Martin Ferrero and Harry Shearer. 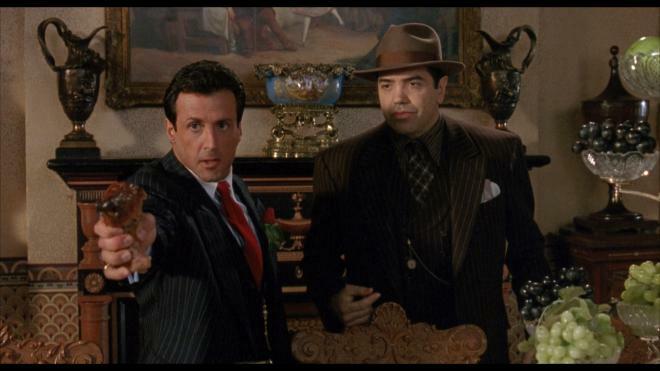 They're Snaps' tailors, but Provolone convinces Anthony that they're notorious mobsters, so when the Finuccis tell Anthony, "When we're done with you, ain't no one gonna recognize you!" it takes on an ominous (and hilarious) meaning. Had Oscar been a box office smash, the Finuccis might have gotten their own film. Now, only the most die hard of movie buffs get it when I yell "Finuccis, sit!" at someone. A lot of times, you'll love a movie from your youth, only to revisit it years later and find it doesn't quite hold up anymore. Thanks to the film's period setting, its (mostly) lack of any modern-day humor, and its solid production value, I'm glad to say Oscar has a timeless quality to it that allows it to work just as well now as it did in 1991. If you've never seen it, give it a shot – you might be pleasantly surprised. Oscar arrives on Blu-ray from Kino Lorber inside a standard blue keepcase with no inserts. There are no front-loaded trailers on the 25GB single-layer disc, whose main menu is the same promotional shot of Sylvester Stallone hanging from a clock that graces the keepcase's slick. Menu selections run horizontally across the bottom of the screen. Oscar was shot on 35mm film and is presented here in its original theatrical aspect ratio of 1.85:1. Although the movie was shot primarily using an interior set and the backlots at both Universal Hollywood and (after a fire at the California backlot) Universal Orlando, the film has some wonderful, colorful costumes and production design which look good in 1080p. Grain isn't too heavy, but enough for the presentation to maintain a film-like quality. While the movie doesn't really "pop" in HD, at least it hasn't been overly DNR'd here, so details are still pretty good. In short, the movie looks roughly as good as it did when it hit theaters back in 1991 (for the couple of weeks it actually played) and that's a good thing if you're a fan of the film. The only audio option on this release is an English 2.0 DTS-HD Master Audio track, that sounds pretty good, all things considered. 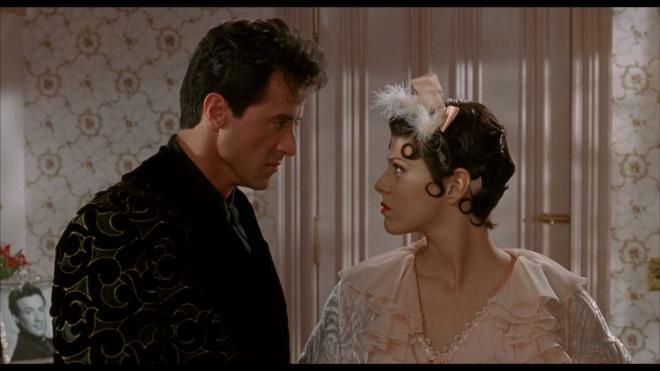 It doesn't take long for viewers/listeners to know that the audio rendering is well done, as the opening credits features a claymation figure singing "Largo al Factotum" (if the name isn't familiar, the song certainly will be), followed by a scene of Stallone's character arriving at his home while it is raining outside that provides some nice separation between the two front speakers. The film is dialogue-heavy, so it is nice to report that the spoken word is crisp and understandable, with no obvious muddiness or instances of dropouts. Interview with Director John Landis (HD 15:24) – Although this is essentially the only bonus feature on this release, this "talking head" bit with Landis is worth the price of admission – as he tells some great stories about making the movie, including a tale about Sylvester Stallone and Kirk Douglas that will give one a whole new perspective on Douglas's participation in the film and the movie's opening scene. The only problem with this bonus feature is that it's far too short... it seems like Landis might be able to go on for another hour about the movie, but what we do get is great. Trailers – In addition to the trailer for Oscar (SD 1:23), the Blu-ray also includes trailers for Once Upon a Crime (HD 2:20), Blame It on the Bellboy (SD, 1:30), Cabin Boy (SD 1:45), and F.I.S.T. (HD 2:29). Each of the trailers must be viewed individually, and there is no "Play All" option. Oscar is one of those movies I've held a cult-like enjoyment of over the past several decades and have always wondered if others felt the same. It's not the typical vehicle for star Sylvester Stallone, which probably explains its inability to set the box office on fire. Still, it's a quite competent screwball comedy from Director John Landis, and one of his better efforts. Loaded with a cast of recognizable character actors and a sharp wit, this Blu-ray release is absolutely Worth a Look.